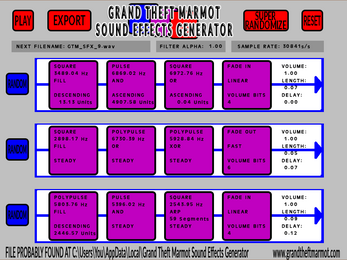 I felt like designing a little program to randomly generate old school video game sound effects for our games, with roughly the limitations that a fictional combination of TIA, POKEY, SN76489, and 2A03 chips would provide. If you didn't notice from the screenshot, I'm pretty handicapped when it comes to user interface skills, but if you think that's bad, you should have seen the one I was using in private. If you don't see the AppData directory, you may have to turn on the ability to see hidden directories. Regardless of the samplerate specified in the generator, this outputs 48000 ks/s 8 bit WAV files, with the volume at half (-3dB) for extra convenience. No licensing is required to use the sounds you make with this. Please just link back to this page if you want to share the program, though. Don't upload the executable to an asset store or something. Going one more step, you can start tweaking the different layers of sound. 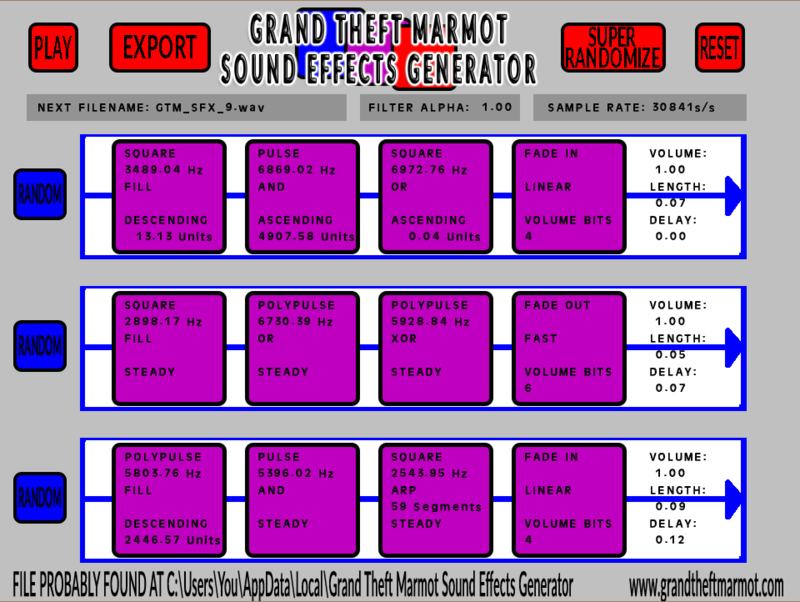 When you randomize something, it automatically makes a three layer sound (the three rows). Each row has it's own volume, length, and delay offset. You can start by modifying individual layers. The random button to the left of the layers will randomize just that layer. You can also hit reset to wipe out all the settings and build a sound from scratch. Each layer lets you combine different elements in different ways. Click the top of the first module to insert a waveform. It will cycle between Square, Pulse, and Polypulse. Beneath the waveform is a pitch. Beneath the pitch is a method of implementing the waveform. For the first module, you'll want FILL, which just fills the buffer with that waveform. For subsequent modules, FILL will overwrite everything before it, so you'll want to use one of the other methods. MIX just combines the two sounds, how they would be combined on a mixing board or in two channels of a DAW. This is pretty simple. ARP will arpeggiate (rapidly cycle between) the previous sound in the chain and the sound of that module. It lets you decide how many steps of cycling you want, which are divided to the length of that layer. OR is a boolean operator which looks at the waveform as a binary signal. If either waveform is high, the output will be high. Only if both waveforms are low will the output be low. AND is similar to OR, but will only make a high if both waveforms are high, otherwise it outputs a low. XOR is a little different- it will output a high if ONLY ONE of the sounds is high, otherwise it will output a low. This will create stranger sounds than the previous two. Below the combining methods is a pitch modulator. It is set to either STEADY (which maintains the frequency specified above), ASCENDING (which increases the frequency throughout the duration), or DESCENDING (which decreases the frequency throughout the duration). After the first three oscillator modules is a volume envelope module. It contours the final combination sound of the oscillators. It has three main modes- NO ENVELOPE applies no contouring. FADE IN increases the sound from nothing to full. FADE OUT decreases the sound from full to nothing. Below the mode is the taper: LINEAR, FAST, and SLOW. This changes the rate of change. Fast will do most of its changing in the first half of the time given. Slow will do most of its changing in the second half of the time given. Below the taper are the volume bits. This specifies the resolution of the volume change. Smaller numbers will sound more "digital" and old school.